Many people think that once pheasant season is over, there isn’t much to do until next season when the hunters start coming back again. Well, that couldn’t be more wrong. Actually, this time of year tends to be even busier than during the season. There are always things to do that got put off last year and need to get completed. Other than these constant upgrades and maintenance issues there are some fun projects that are getting completed. Of these is the planting of food plots! This year we are trying a few different styles of food plots. 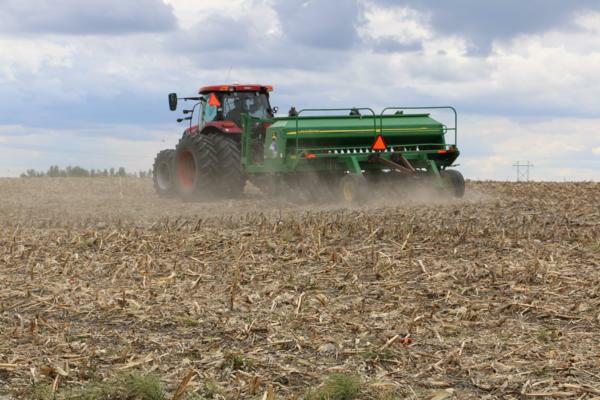 Food plots have different purposes depending on the crop that they contain. Some provide food throughout the year, some provide food primarily for chicks, some provide cover, and some provide all of the above. We decided to mix it up quite a bit this year. With a few of our plot locations, we are trying some that are comprised of crop species that are designed to flower from spring through fall. Plus these will provide seeds during the winter months for wildlife forage. These pollinating plants are a perfect attractant for bees, insects, butterflies, moths, ants, etc. which are almost comprised of 100% of the pheasant chicks diet. This should prove to be an absolute excellent source, habitat, and cover for the upcoming season. With a few other locations, we decided to try a sorghum food plot. Sorghum food plots (along with the corn plots that we have) are among some of the best sources of food for the pheasants. These crop species stand very well during the winter to help provide shelter, retain grain on their stalks, and provide foods that contain high energy to help the birds survive the winters in our area. Not to mention, these crops are fantastic to hunt in! A few of the other plots have a variety of mixtures which incorporate sorghum, grain crops, and other species that should provide excellent habitat and food sources throughout the season. Food plots should be somewhat methodically planned out and have a rhyme and reason for them. Hopefully, these turn out and provide adequate purposes for which they are designed. As long as they provide the cover desired, the food sources needed, and the habitat required then it should be a success.